It’s no great surprise that ZOMBIE – known in the UK more commonly as ZOMBIE FLESHEATERS thanks to its legendary original Vipco release and in Italy as ZOMBI 2 – won the Horrorscreams poll for favourite Lucio Fulci movie. Sure, it had a lot of competition, and it’s very much a matter of personal opinion as to whether you believe it is truly a superior movie to the more ambitious likes of THE BEYOND and DON’T TORTURE A DUCKLING, but this is the one that gore fans from all generations will tend to remember when considering the prolific career of the late, lamented Mr Fulci. Conceived (and structured) as an adventure movie with a horrific streak, it rode the coat-tails of the vast success of Romero’s DAWN OF THE DEAD. DAWN, of course, was renamed ZOMBI in Italy and released in an alternate cut overseen by producer Dario Argento, along with an unforgettable original score by Goblin instead of the library music cues originally used by Romero. It led Fulci on his infamous mini-cycle of in-your-face splatter movies (capped by the fan-dividing, non-zombie urban slasher NEW YORK RIPPER) and, in truth, has aged better than the majority of the gore-strewn Italian zombie flicks that followed in its wake. Giving us unsettling, single-minded decaying zombies rather than the colourful, comical ensemble of DAWN OF THE DEAD, Fulci’s movie also replaces Tom Savini’s cartoonish splashy gore with show-stopping physical mutilations and violence that feels much harsher, ensuring its place on the “Video Nasties” list. In isolating his zombie outbreak to a Caribbean setting, incorporating an emphasis on voodoo superstitions and the machinations of a meddling doctor, Fulci also, ironically given the splatter content, returned the sub-genre to its origins. Oddly, ZOMBIE is a lot more old fashioned than the Romero movies: the relentless tribal drumbeat of Fabio Frizzi’s haunting score reinforces the notion that the subtle, moody I WALKED WITH A ZOMBIE was as much an influence on the setting and mood of ZOMBIE as the success of DAWN OF THE DEAD was on its level of gore. The sluggish first half of ZOMBIE is its weakest aspect, though it does offer ominous hints of things to come. Fulci’s fascination with graphic violence (present, if only intermittently, in earlier work as diverse as LIZARD IN A WOMAN’S SKIN and THE PSYCHIC) is established from the very first scene as the camera zooms into a fresh zombie head wound. The opening set piece on an eerily deserted sailboat – New York City skyline in the background offering a hint of the film’s ending – is a potent introduction to Fulci’s grotesque zombies: featuring Captain Haggerty’s memorable fat, bald zombie alongside a barrage of close-up squirting neck wounds. As would become tradition in his subsequent splatter movies, Fulci cameos as the newspaper editor who assigns reporter Ian McCulloch the task of investigating the deaths on the boat. McCulloch ends up tagging along with Tisa Farrow (whose one, only expression wears thin after a while and was also a debit in ANTHROPOPHAGUS THE BEAST) to explore the tropical island on which her father was last heard from. Unwelcoming locals warn of the island’s “curse” while the late Richard Johnson (who gets a box round his name in the titles like he’s Henry Fonda or sumthin’!!) is nicely frosty and efficient as the man of science trying to separate local superstitions from outlandish reality. 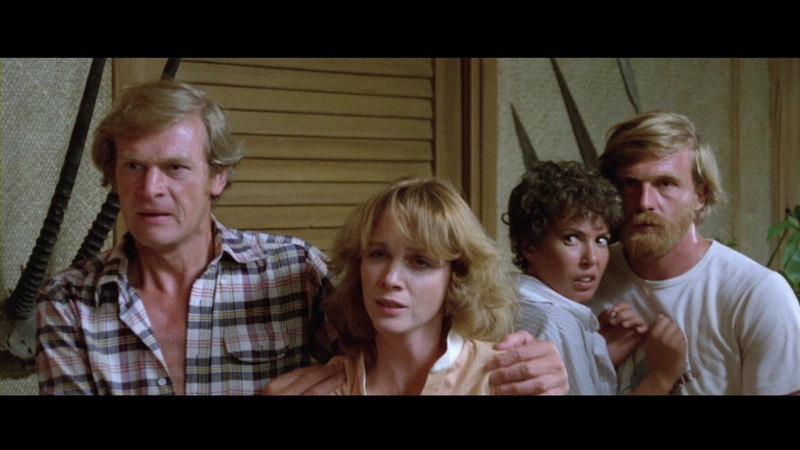 Dialogue scenes in Fulci’s horror pictures were often super-flat at best, unintentionally hilarious at worst, and the early part of ZOMBIE is weighed down by typically duff dubbed performances and stilted conversation : the attempts at flirty banter between McCulloch and Farrow are truly painful to watch. This relatively quiet stretch of the movie, however, does have unsettling subtle touches before all Hell breaks loose: there’s an effectively creepy non-gory shot of a corpse quietly stirring under a sheet during an autopsy, providing an uncommonly low-key frisson. Prefiguring the infamous scene to come, Fulci also lingers ominously on a zoomed-in shot of Olga Kartalos’ (as Richard Johnson’s long suffering wife) striking green eyes. Sandwiched between the slow first half hour and the lively climax are two of the most memorable sequences in Fulci’s entire career. Auretta Gay goes scuba-diving in just a skimpy thong and winds up in the middle of a surreal battle combining two Italian horror trends of the time: Zombie movies and JAWS rip-offs. The sequence, in which Gay first evades a shark and then flees from a zombie before the two creatures fight to the death, remains astonishingly strange and well executed. It represents the only time in ZOMBIE that Fulci places the zombies in borderline-comic / offbeat scenarios vaguely reminiscent of the playful tone of DAWN OF THE DEAD. Everyone, of course, remembers the extreme close-up ocular torment inflicted on Kartalos in the film’s other unforgettable sequence – a sadistic forerunner of ever more extreme horrors inflicted upon women in later Fulci horrors. 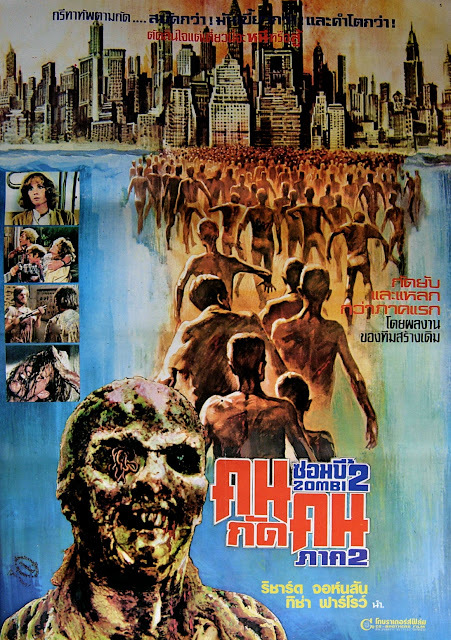 The build-up to this oft-censored money shot is just as notable, however: after taking a typically gratuitous 70’s horror movie shower, Kartalos is at the centre of an extended, suspenseful home-invasion sequence, with Fulci creating a palpable sense of threat around a zombie represented only via a pair of grabby, decomposed arms. The movie’s show piece Gino De Rossi gore FX and bloody zombie scenes are so impressive, that you almost forget a typical flaw of this sub-genre: ZOMBIE is entirely reliant on characters standing still to be eaten by the slow walking dead. The women in particular are masters at becoming immobile and whimpering in the face of danger: Auretta Gay survives the harrowing underwater encounter only to become frozen in fear later on so that a zombie can yank out her throat with élan. Not to worry, because ZOMBIE is all about its zombies and what they do to the hapless living. Fulci’s undead are superbly sinister – decayed, worm / maggot ridden creations, eyeless, credibly cadaverous shamblers that are leagues more sinister than Romero’s less monstrous equivalents. The film has an eerie charge whenever they’re on-screen. The climax, a NIGHT OF THE LIVING DEAD-style siege scenario, incorporates several marvellously evocative shots of the mist-enshrouded legions of the dead slowly rising from their graves and staggering together in small, rotten crowds. And, of course, there’s no shortage of crushed craniums, exploding heads and open, gushing wounds. While DAWN OF THE DEAD ultimately discovered the optimism its predecessor lacked, Fulci – who would cap THE BEYOND and CITY OF THE LIVING DEAD with nightmarish, downbeat final scenes – prefers the apocalyptic approach of NIGHT OF THE LIVING DEAD. ZOMBIE thus ends deliciously with Ian McCulloch’s immortal words “Let’s see if we can find something cheerful on the radio” before a NIGHT-inspired audio broadcast shrieks “I’ve just been informed that zombies have entered the building…AARGH!” These panicked words play out over a classic shot of the living dead ambling over Brooklyn Bridge and end Fulci’s first venture into outright splatter territory on a suitably disquieting note.